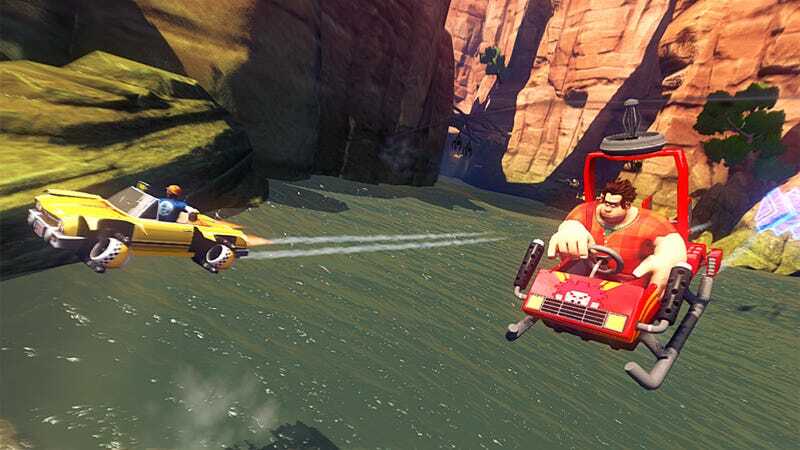 Sega recently announced that their upcoming game Sonic & All-Stars Racing Transformed will feature the titular hero of Disney's November film Wreck-it Ralph as a playable character. The movie's director, Rich Moore, calls it a "dream come true" that we can see "Wreck-It Ralph in a real video game alongside Sonic and other iconic Sega characters." In one way, it's just another blurb about self-congratulatory corporate marketing. Get a brand-new video game movie character into a known video game franchise coming out about the same time the movie does, and increase brand awareness about both the game and the film. Great. That's how these things work. Tie-ins are nothing new under the sun. But the story is more than just the newest Sonic racing game. Disney is reaching far and wide with Wreck-it Ralph, and while it's hard to blame them, the outcome is almost sinister. Disney stories are core to many American kids' childhoods. They're part of our cultural consciousness. And with the way they are pushing Wreck-it Ralph, Disney is now trying retroactively to rewrite the childhoods of those of us who have already grown up. Wreck-it Ralph is itself a pretty clever idea for an animated feature. The film features a top-notch voice cast, and hearkens back in many ways to the brilliant Who Framed Roger Rabbit?. Instead of bringing the world of cartoons together in the golden age of Hollywood, it brings the worlds of video games together under the beeps and bells of a classic arcade. And much as the latter movie invented Roger Rabbit, and set him among his more well-known Disney and Warner Brothers brethren, Wreck-it Ralph has invented a character in order to set him among his better-known Sega and Nintendo cousins. Of course, to invent a video game character, Disney has had to invent a game for him to come from, and that game is Fix-it Felix. The "long lost" arcade cabinet for Fix-it Felix showed up at E3, straight from 1982 (nudge nudge, wink wink). The game, of course, is also available on the website and for iOS devices. By making the game, and setting it loose into the world, Disney has made their new characters as "real" as Bowser or Sonic ever were. And yet, Ralph's presence out in the world with the others still rings hollow. The arcade game is an artificial nostalgia, a creation meant to make us feel fond, distant memories of playing a game that didn't exist. It's supposed to make us laugh referentially, to make us feel that even though Wreck-it Ralph wasn't part of the 1980s we remember, he may as well have been. Disney knows marketing, and what they're doing with Wreck-it Ralph is brilliant, in a way: they're giving a veneer of plausibility to the patently impossible, making this a universe that not only kids but also their parents can buy in to. And it's not the first time; Tron has its own attendant mythos that formed the foundation for the "Flynn Lives" alternate reality game (ARG) and the Tron: Legacy sequel, complete with "original" arcade games. It's not uncommon for a game's marketing to work itself around an alternate reality in some way. There are two kinds of ways that an ARG can try to remake reality. One is by adding to the world we thought we knew; the other is by rearranging it. Something like what The Secret World or Watch Dogs have done are the kinds of game that build on the world, taking snippets of history and requiring players to look at and reassemble them in new ways, with a few planted guideposts along the way. Disney, though, is taking the opposite approach: injecting its reality into our own and asking us to build feeling around it. Fix-it Felix is a real game now, and Wreck-it Ralph its villain. But it's not a product of the 1980s, nor does it stand on its own. It's as thorough a movie tie-in as ever was made. And yet, Ralph is getting the veneer of respectability that will let him sit in a room with Bowser and Dr. Robotnik and somehow not seem fictional as compared to them. It's a strange blend of realities, with the alternate forcing its way into the real. But the upshot is that Wreck-it Ralph is just as here to stay as any Disney princess ever was. Remember when you first saw him smashing windows in the arcade? Yeah, me neither. But by next year, we probably both will.